It’s obvious that in the year 2019 having a mobile application is necessary for your business. I will not mention that on the intro. Let’s go straight to the essence of the article. Before we dive deep into the React Native tutorial, let’s do a quick overview of the mobile development frameworks and technologies that stay alive in 2019. Shortly, there are three major types of mobile app development in 2018: Native App Development, Hybrid Development, and Cross-Platform Development. If we briefly analyze the popularity of technologies that allow using one codebase for several platforms, we can see that React Native is in the first place. In this article we will help you choose the right technology for your idea and show you how to start developing a simple React Native application. A native mobile app is a smartphone application that is coded in a specific programming language, such as Objective C/Swift for iOS or Java/Kotlin for Android operating systems. Native mobile apps provide fast performance and high reliability. However, this app type is expensive to develop because it is tied to a single operating system type. Xamarin is a framework for developing a cross-platform mobile application using C#. Xamarin provides a single language C# and runtime that works on three mobile platforms (Android, iOS, and Windows). With Xamarin we make a mobile application which looks and feels completely native. You can write one C# codebase which will have access to all features available for native SDK. Let us show exactly why using Native React mobile apps development is a great idea nowadays – sometimes even better than native development. Mobile development has witnessed unprecedented growth. 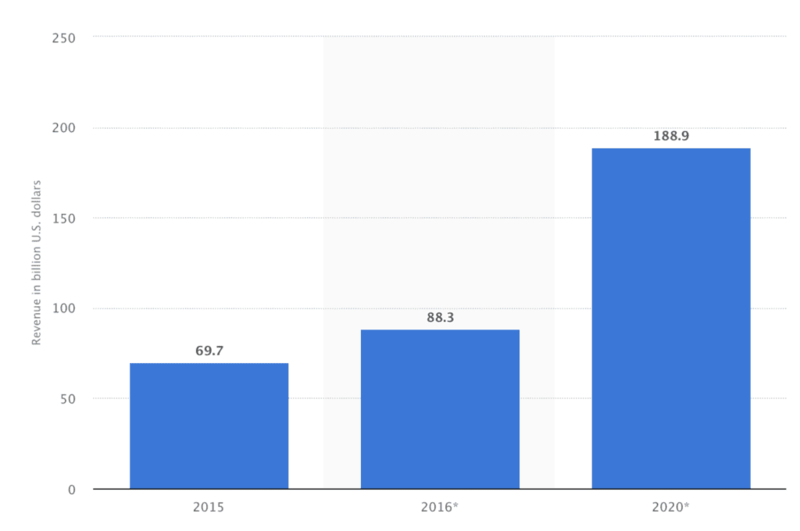 According to Statista, mobile applications will generate an estimated 188 billion U.S. dollars in revenue via app stores, advertising and in-app purchases by the year 2020. Single and business users require high-standard apps with flawless performance, multiple screens, easy navigation and good design. On the other side, high-performing, good quality native apps are very time-consuming to develop compared to cross-platform apps that provide faster development but compromise on performance and support. React Native seems to be a viable solution for building high-quality apps in a short time with the same performance and user-experience standards that native apps provide. Companies that developed apps in the past had to assemble and manage two teams and two different codebases. This led to separated teams and slower build times. With Mobile UI frameworks like React Native, engineers can code for both platforms using one language with one codebase. React Native apps are compiled into natively written code, which enables React Native to not only work on both operating systems, but also have same features on both platforms with no lag. Here’s a little fly in the ointment: developers will still need to write native code. React Native is a great choice for simple applications where the APIs have a clear bridge between two platforms. Eventually, the APIs will inevitably stop operating exactly the way you want, and to make the necessary adjustments you’ll have to dive into the native libraries anyway. Visual Studio Code with React Native Tools – A Visual Studio Code extension that provides a development environment for React Native projects. Using this extension you can debug your code, quickly run react-native commands from the command palette and use IntelliSense to browse objects, functions, and parameters for React Native APIs. Use Sketch for designing screens and Instabug for debugging apps and error monitoring. There are a couple of things you need to install to set up the environment for React Native. I use OSX as a building platform. There are two ways to start building React Native application: using Expo or building React Native App from CLI. Expo is the easiest way: it removes some of the barriers up front. Install the Expo client app on your iOS or Android phone and connect to the same wireless network as your computer. Open App.js in your text editor of choice and edit some lines. The application should reload automatically once you save your changes. If you have apps that already work with complex business logic and many screens that are built on Swift/Java/Kotlin and a team of native mobile developers that are working well on support and development application, I do not recommend to move to hybrid or cross-platform technologies. That is the reason why Airbnb shut down the development of their mobile app using React Native. We are the creators of React Native Starter. React Native Starter is a mobile starter kit that allows your team to fully focus on the development of the features that set your product apart from the competitors, instead of building your app from scratch. You have 16 ready-to-use components, advanced charts library, chat application plus many more screens and components. Flatlogic are developing admin dashboard templates and react native templates. We are listed among top 20 Web Development companies from Belarus. Since the last 5 years, we have completed around 20 big projects for small startups and large enterprises. As a team, we always have a deep desire to help our clients.